Kitty the cat showed up at Kristi’s house and decided to take up residence. Of course, being a cat, he didn’t ask if he was welcome. PFF to the rescue! Kristi brought him to PFF where he quickly made lots of new friends. Through one of our caring employees, we gave him up to Hawk Creek Animal Shelter last week. 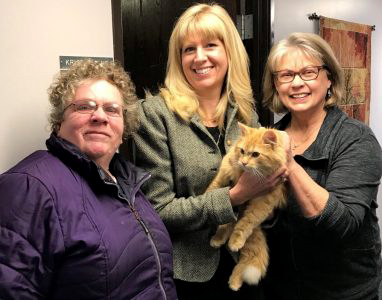 It was there that Kitty met his new “forever family”, and moved to a brand new home. And probably got a brand new name!